The 2015 Victorian Awards for Planning Excellence have been announced, shining the limelight on projects in regional Victoria. Australian tourism business TRC Tourism has taken out the award for best planning ideas (large project) for its ‘Trail planning toolkit’ designed to deliver exceptional recreational trail experiences. Initially designed for Barwon South-West Region, the guidelines readily transfer to all regions for use by government agencies, communities and investors. A 12-year rezoning process of 125 hectares of Maiden Gully land on Bendigo’s edge, to make way for a new community, gave Birchgrove Property the Hard Won Victory Award. The process has delivered $6 million developer funding for community infrastructure and a 20 per cent internal open space contribution. Damien Kennedy won Planner of the Year. Kennedy held a key role in Victoria’s complex ‘regional growth plans’ as part of a Victorian state government team. Andrew Bishop won Young Planner of the Year for his work with Wyndham City Council and Victorian Young Planners. In the metropolitan area, Rush Wright’s Dandenong Civic Centre (feature image above) won the Great Place Award and Brimbank’s Transforming the Public Realm took the From Place to Plan Award creating a municipality of walking and cycling networks. Intensifying Melbourne by Professor Kim Dovey and Ian Woodcock, a report quantifying issues and principals raised by urban planners for years, took the Cutting Edge Research & Technology Award. City of Melbourne was awarded the Public Engagement & Community Planning Award for Creating a City within a Forest. The project gives community access to contribute and access individual data of the city’s 70,000 trees. Victorian President of the Planning Institute of Australia, James Larmour-Reid said the Awards for Planning Excellence were an opportunity to take stock of what the planning profession has to offer. “(The) winners and commendations represent a vast array of Victoria best planning projects and talented planners. The achievement represents reward for efforts, a vindication for commitment and motivation for continuous improvement,” Mr Larmour-Reid said. Commendation: Planisphere for Protection of the Yarra River Corridor. 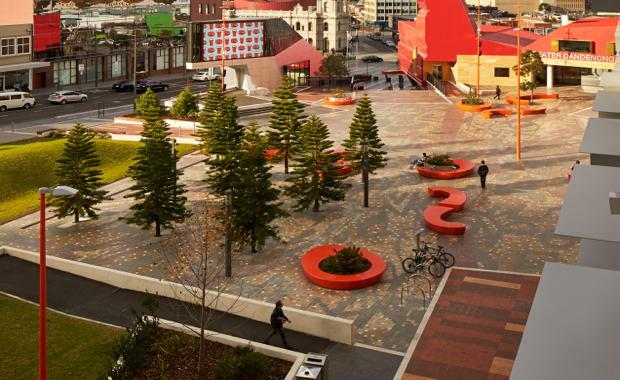 Award: Brimbank City Council for Transforming the Public Realm. Award: Professor Kim Dovey and Mr Ian Woodcock, University of Melbourne for Intensifying Melbourne. Commendation: Dr Roman Trubka, Dr Stephen Glackin, Phil Delaney, Tuan Ngo and Jack for Barton for Envision Scenario Planner, Greening the Greyfields.